Warning: Viewing this post may cause severe donut cravings. We cannot be held accountable for any time lost from work or school as a result of spontaneous family trips taken to Union Square Donuts. 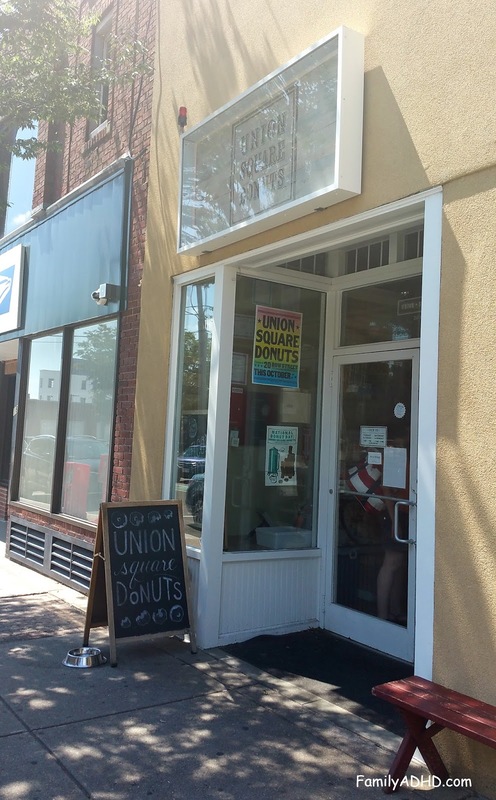 Union Square Donuts is a Somerville-based artisan donut shop that brings something extra funky and delicious to the otherwise bland (in our opinions) Massachusetts donut scene. Tucked away in a cozy shop in Union Square, it tops our list of places to visit just outside of Boston for families both local and visiting. 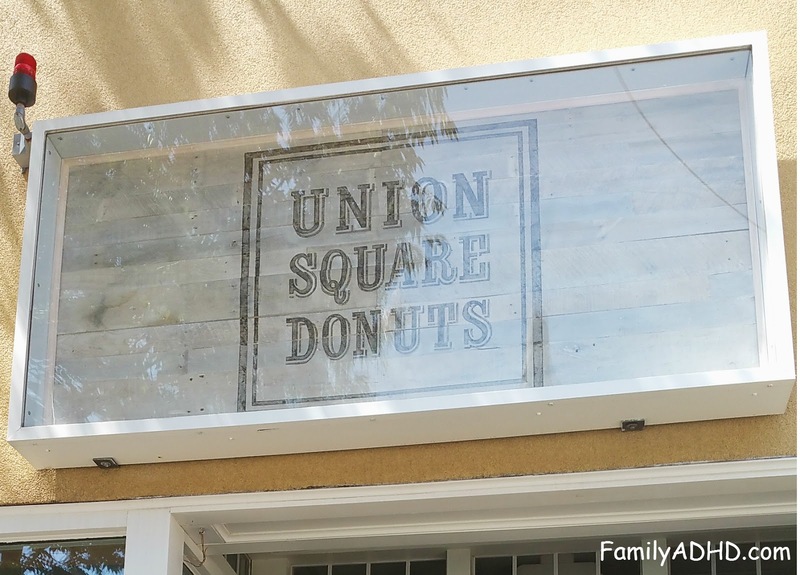 The list of donuts available at Union Square Donuts is eclectic–ranging from traditional favorites to more unique concoctions like Sea Salted Bourbon Caramel. 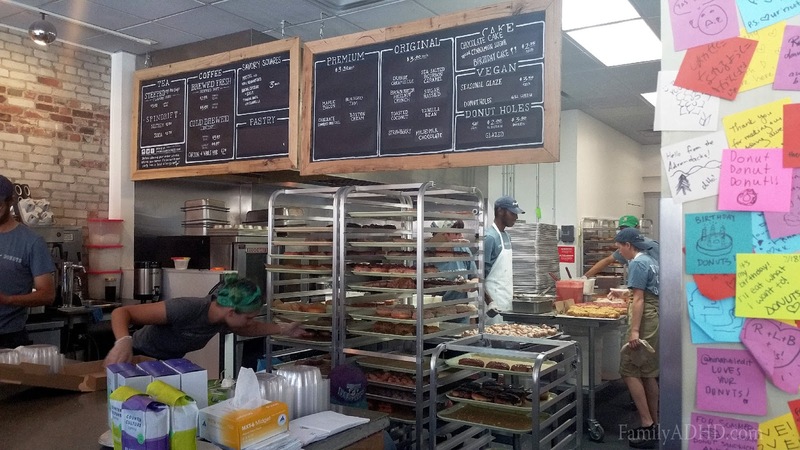 In addition to sweet donuts, Union Square Donuts has also created a menu of savory squares. They have several vegan options as well (no gluten-free options). They do offer coffee, which we found to be pretty good, but not something included in this post as we wanted to focus on the donuts. In addition to their shop in Somerville, Union Square Donuts is a vendor at Boston Public Market (which we recently did a feature on) and seems to frequent other farmer’s markets as well. Keep an eye on their instagram account for details on other locations they pop up at. Bring quarters for metered parking. Look at the menu ahead of time as the line moves very quickly and it can be a little anxiety-provoking if you’re holding it up with indecisiveness–especially with little ADHDers. Consider leaving sensory kiddos in the car if they have issues with small, busy spaces as the shop can get fairly busy and cramped while waiting in line. They do accept credit cards so there’s no need to make an extra stop for cash unless you plan to go to other shops in the area. As you may already know if you’re from the area, there are still plenty of Boston and Cambridge shops and restaurants that still take cash-only. Go earlier in the day if you want to make sure you have all the flavors to choose from. While we’ve found Union Square Donuts does a great job at pumping out loads of delicious donuts, some definitely sell out as the day progresses. We got there around 11 am on a Sunday and found that only a handful had sold out, but you never know! The storefront is fairly small from the sidewalk, so if you’re not familiar with the area watch for the chalk sign on the sidewalk. This sign = the entryway to deliciousness! For those that aren’t familiar with Union Square or Somerville in general, parking is infinitely better here (in our opinions) than most other areas of Boston or the surrounding towns. There’s metered parking everywhere that is easy to get to. Just make sure to bring quarters so that you’re not left trying to find a shop that can exchange your bills for coins. While we’ve found most shops are willing to, the wait in line to get to the register could be long enough to land you a ticket. The inside of Union Square Donuts is fairly small with a handful of tables, a restroom for customers (always nice to know for families with little ones) and just enough room for a long, but fast-moving line to snake its way around. 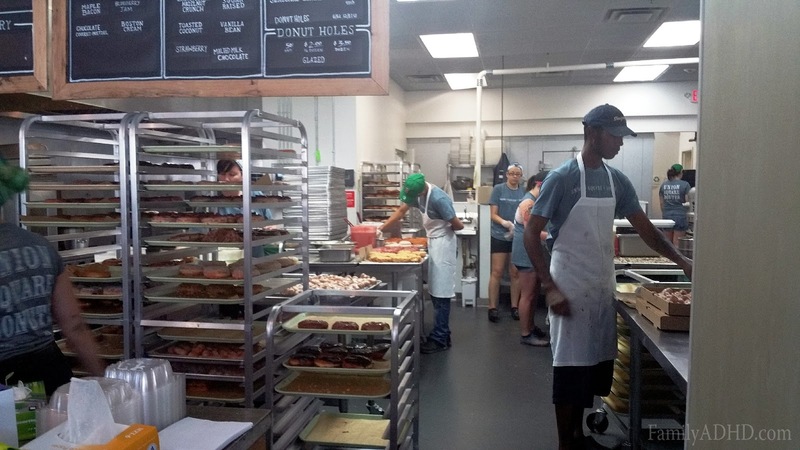 The opposite of some popular donut chains, the inside is primarily occupied by the kitchen behind the counter, which we were more than fine with given what that kitchen produces on a daily basis! There’s where all the magic happens at Union Square Donuts. The menu is quite large and changes when new flavors are added, including some seasonal ones. Yes, we actually sampled 14 flavors, but don’t worry, we only tasted small slivers of each! Here are the 14 donuts we tried and our thoughts on each. 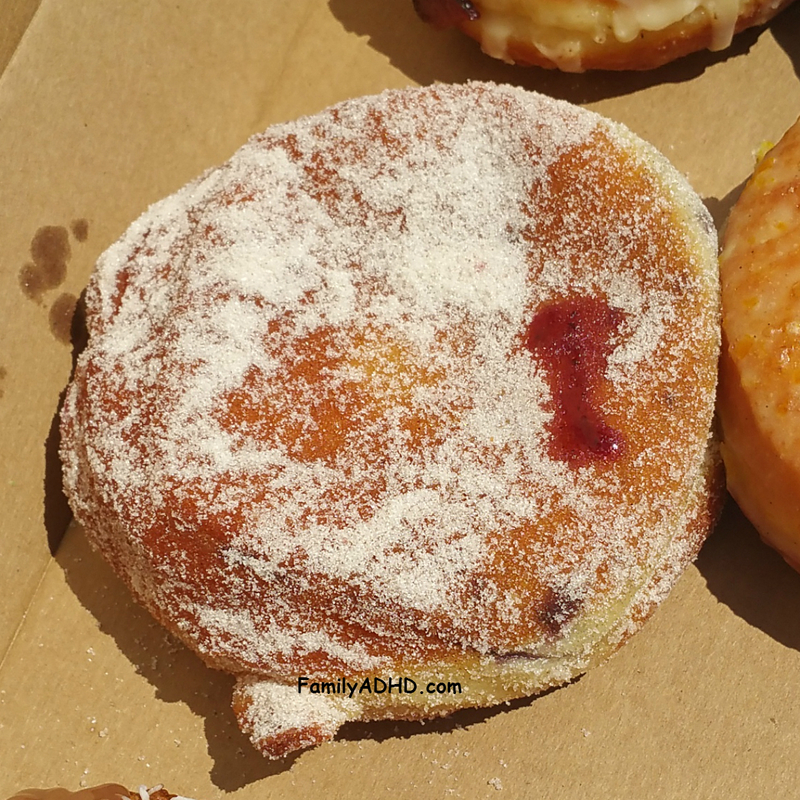 Union Square Donuts Blueberry Jam – light, fried dough-like exterior with fresh blueberry pie like filling. There was nothing fake tasting about the blueberry filling, which we often find is the case. Fresh and delicious even if you’re not generally a jam donut fan! This earned the #2 spot on our oldest’s list of favorites. If you love Boston Cream donuts this is the king of all Boston Creams. Absolutely amazing! This earned the #1 spot on Mom’s list of favorites. 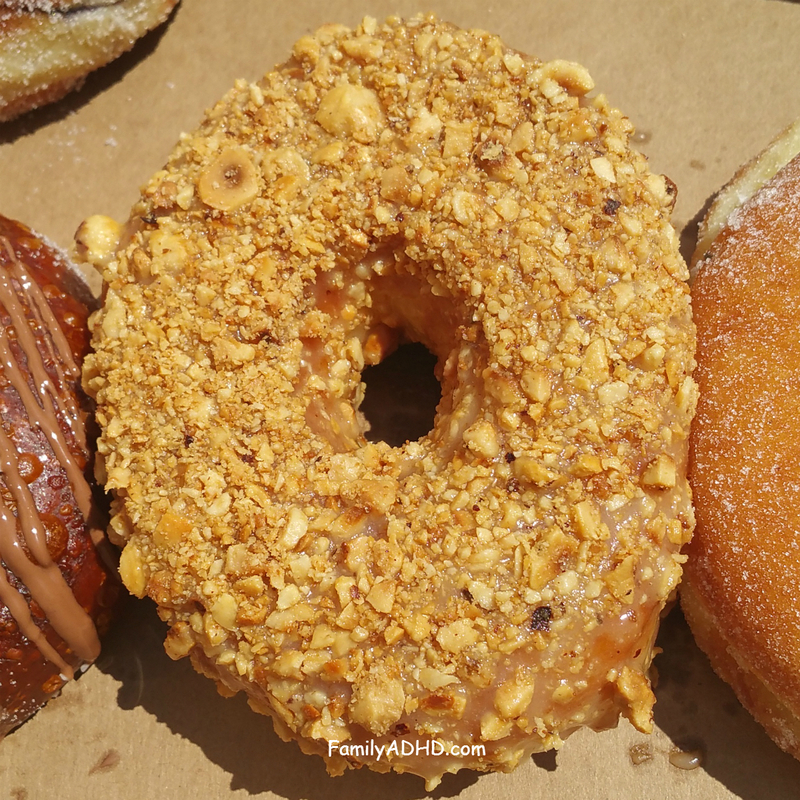 The donut itself was light and fluffy, but it is complete smothered in delicious hazelnutty goodness, making it a heavier donut overall. It’s very good, but may be a lot to finish in one sitting. 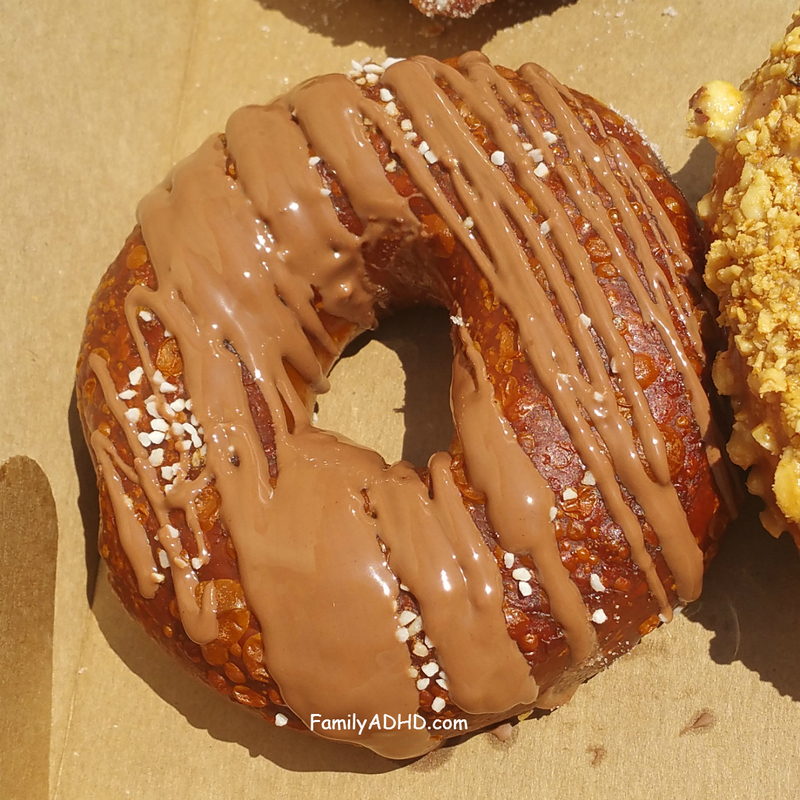 When we first heard chocolate covered pretzel donut, we assumed it was a donut covered with crumbled chocolate covered pretzels, so you can imagine how surprised we were to find the actual donut was essentially the best soft pretzel Dad had ever eaten coated with delicious milk chocolate! This was Dad’s #1 favorite and a must for any chocolate covered pretzel lovers. If you like a nice light chocolate malt, this is your donut! This was #2 on our youngest’s list of favorites. 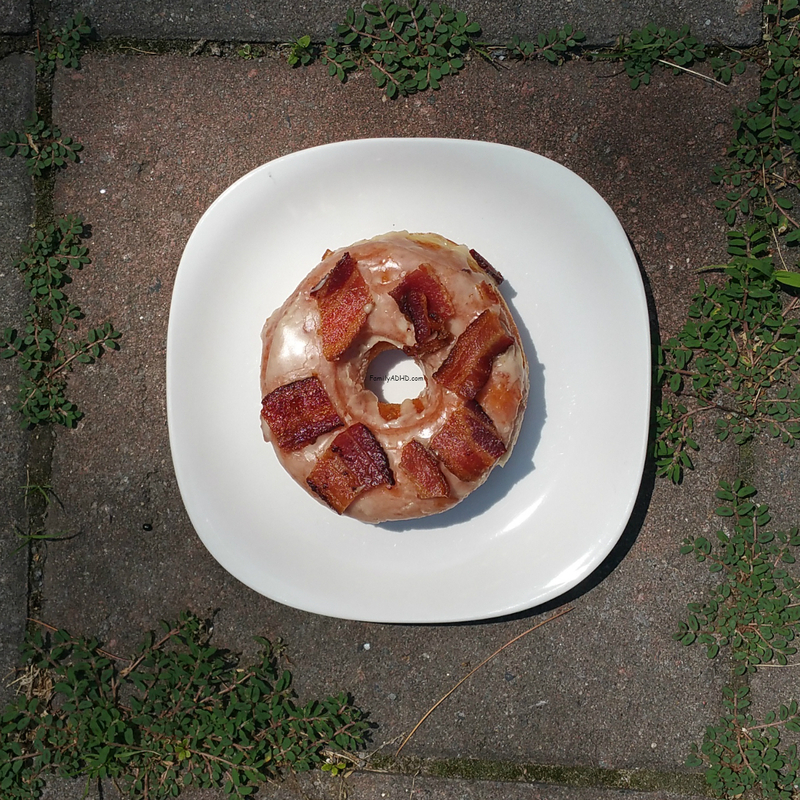 This donut combine all of the most delicious flavors of your favorite breakfast in each bite. It is stellar! This donut was tied for the #1 spot on Dad’s list of favorites. 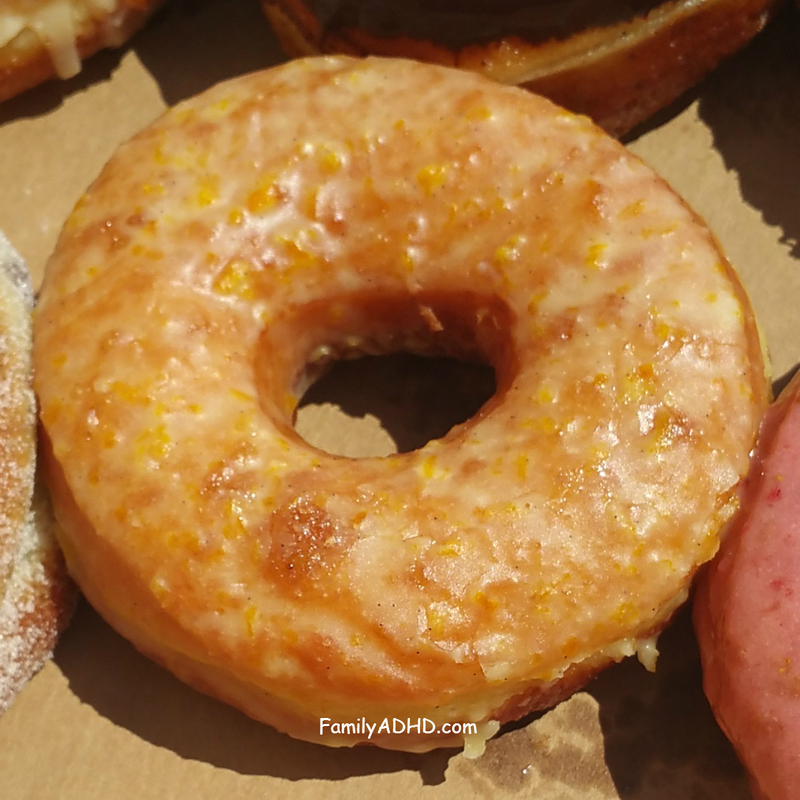 This donut is so fresh and delicious tasting–just like a yummy creamsicle! This scored the #1 spot on our oldest’s list of favorites and the #2 spot on Dad’s list. The bourbon flavor is delicious and not at all overpowering while the caramel is perfectly portioned–not too thick. I think we were surprised by how much we enjoyed this one! This took the #3 spot on Dad’s list of favorites. This literally tasted like a light, fresh strawberry shortcake. It was absolutely delicious! This tied for the #1 spot on Mom’s list of favorites. This is a solid donut and despite being fairly basic in flavor, it blows donuts from most other shops out of the water! 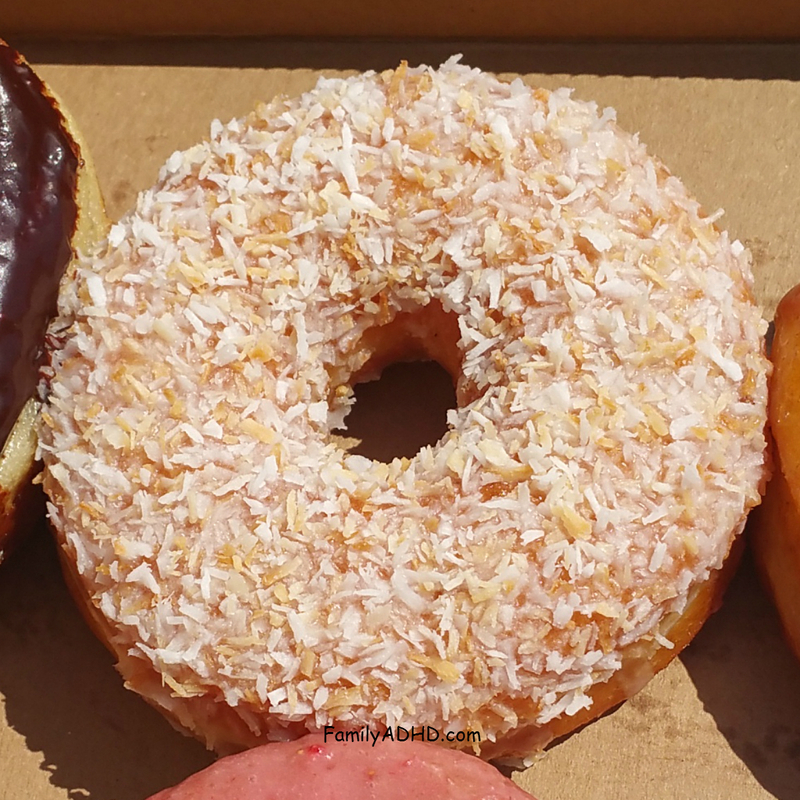 There is nothing stale or bland about the coconut on this donut! It is absolutely lovely, especially if you’re a fan of real coconut. 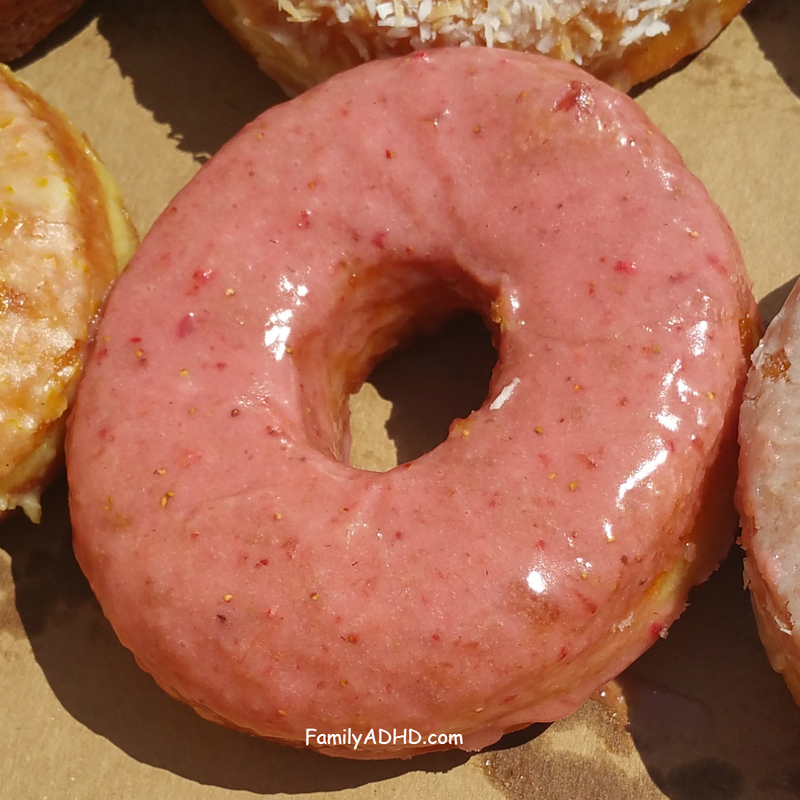 This donut snagged the #2 spot on Mom’s list of favorites. 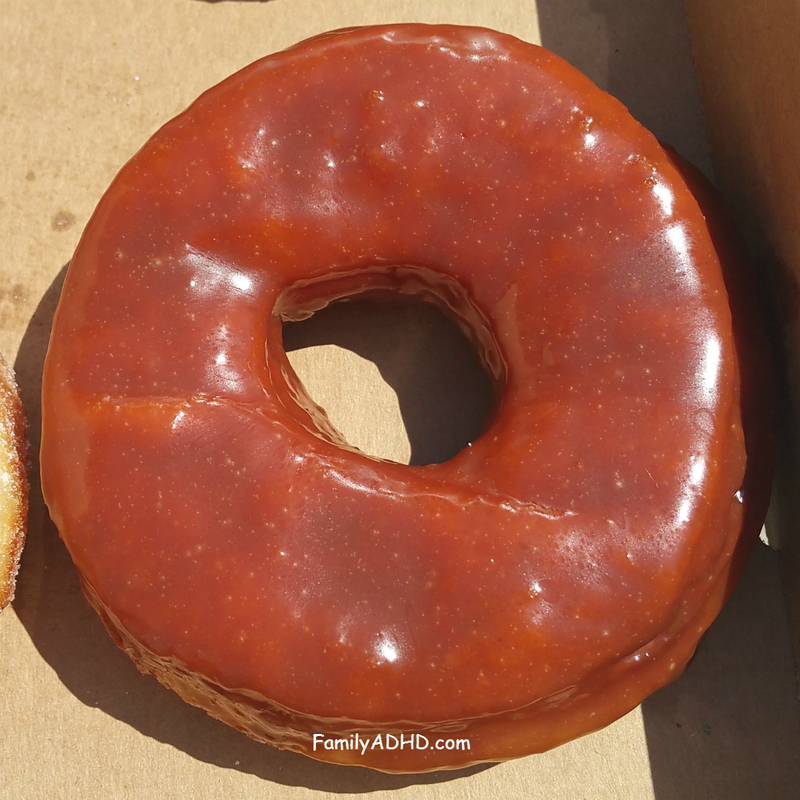 Don’t be fooled, finding a really delicious glazed donut is actually quite hard! Most are too dense or have a synthetic vanilla flavor. This donut is absolute perfection! This donut was eaten too quickly for anyone to catch a pic of it, but it is definitely worth mentioning. 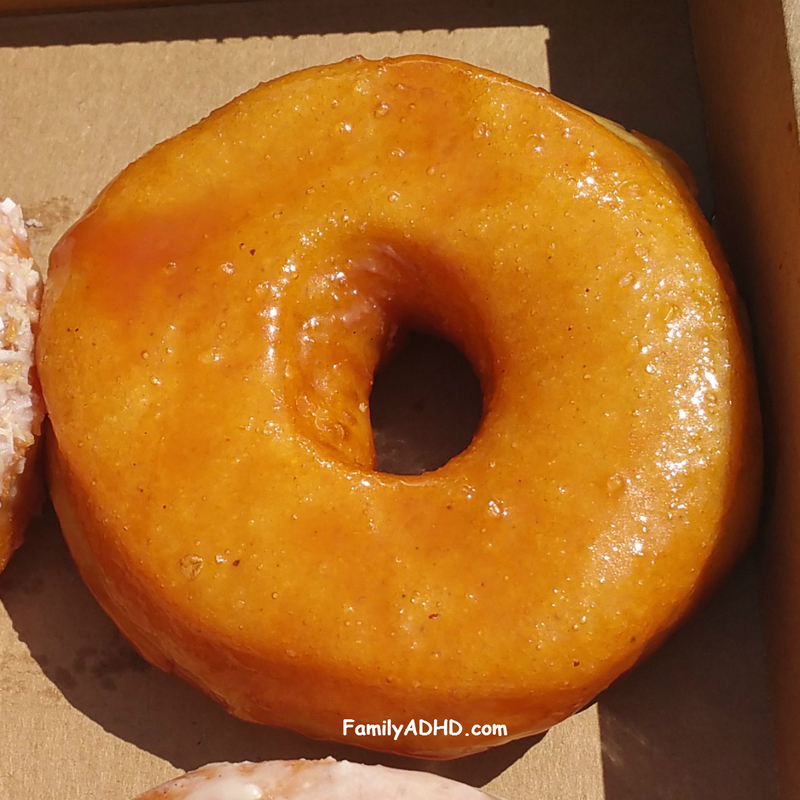 If you love traditional donuts, the kind sold at small farm stands alongside fresh cider in New England, this one is fantastic! Union Square Donuts offers a delicious donut sanctuary for families that do not in fact run on Dunkin’s despite being from New England. 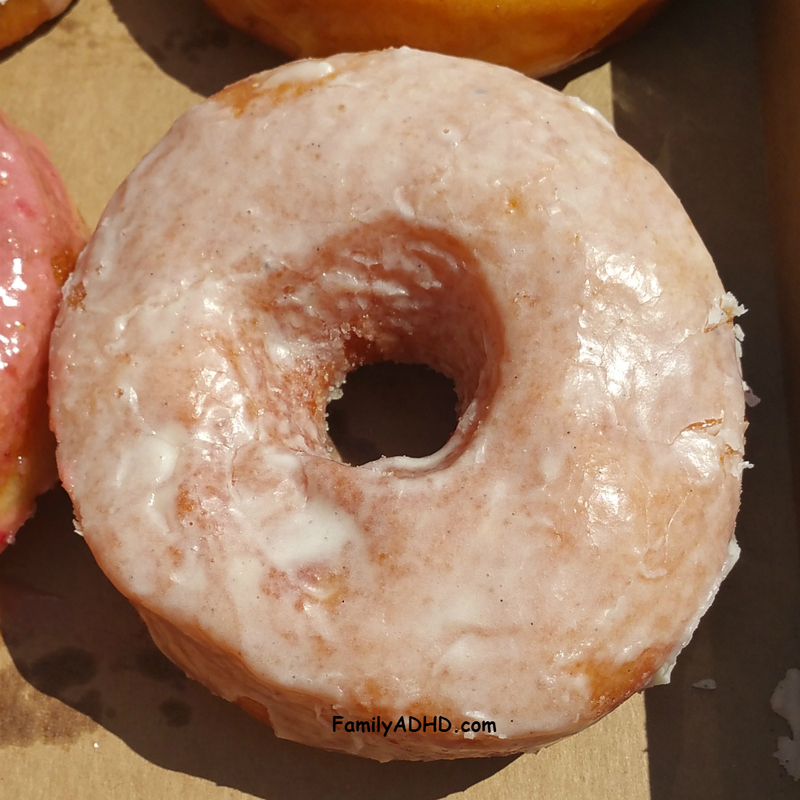 We haven’t come across a donut shop in Massachusetts yet with as many unique flavors, especially one that executes each one so perfectly. We have nothing bad to say at all and have done our fair share of raving about Union Square Donuts to everyone we know since our first visit. While not every donut may be your favorite, it’s clear that each is thoughtfully made and delicious in its own right. 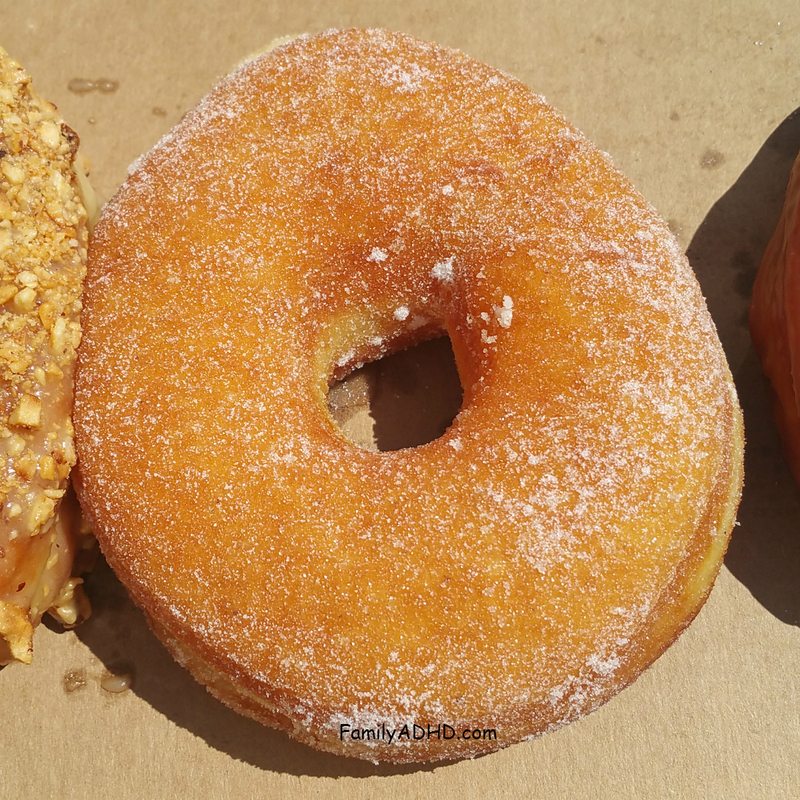 Now, if only Union Square Donuts could offer a selection of gluten-free donuts! Either way, this is definitely a must for families both local and visiting. You will not regret it! 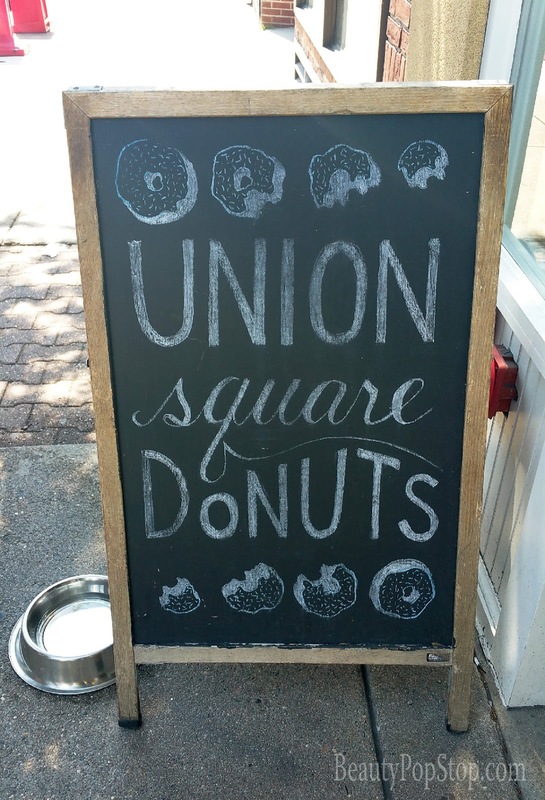 Have you tried Union Square Donuts? Which flavor has peaked your interest most? Note: As many of you probably know, I (Mom) am allergic to wheat. Thankfully my reaction is generally fairly light if I only eat a little once in a blue moon, so I did give these a try. However, we wanted to mention this as many of you know I stick to a wheat-free diet 99% of the time and wanted to make sure there was no confusion. These are not wheat-free or gluten-free and I would never recommend anyone with an allergy or Celiac disease eat foods they know they cannot. I have spent a lifetime dealing with my allergy and know my own limits–I also do not respond with any sort of respiratory reactions. Seamus & Liam BeanBoozled Challenge! Oh wow, they all look so delicious! I love maple bacon. OMG the maple bacon. I'm dying over here!!!! SO GOOD! OMG now I need some donuts! Delicious! 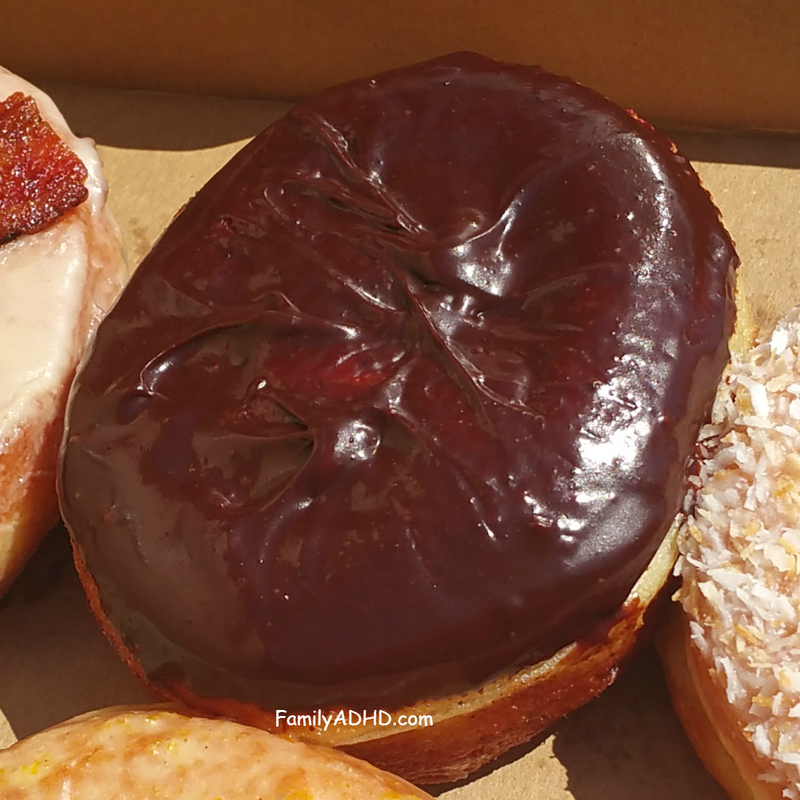 I am so glad that we stopped and picked up donuts yesterday from the local shop that we love, or I would be having a serious donut craving right now after reading this post! 🙂 Love quirky, local owned donut shops! And of course you had to try at least 14 of them. 😉 How else could you give a comprehensive review? lol! 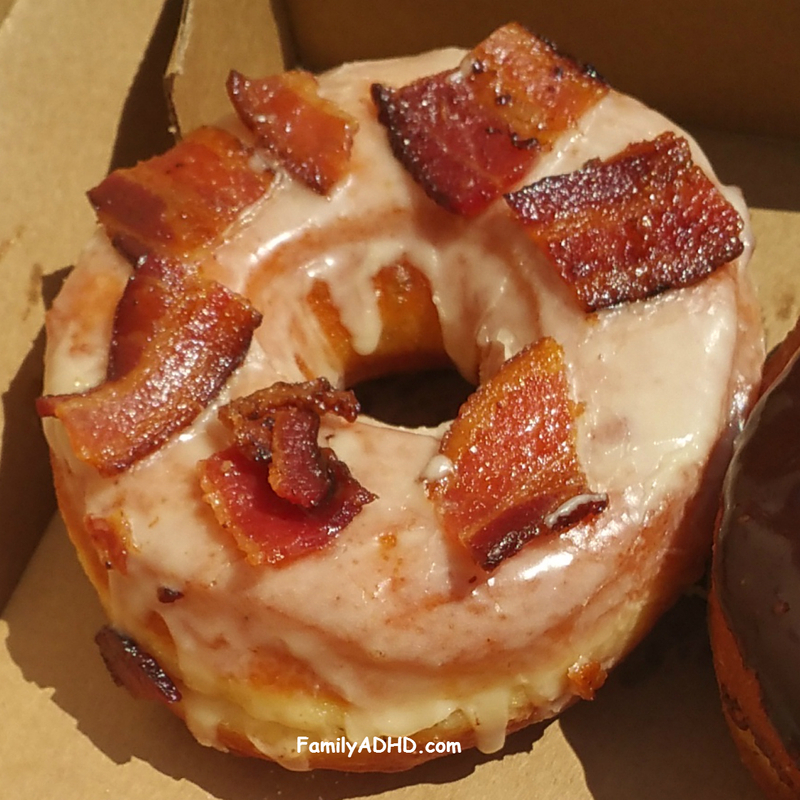 I need that bacon doughnut! Oh my!